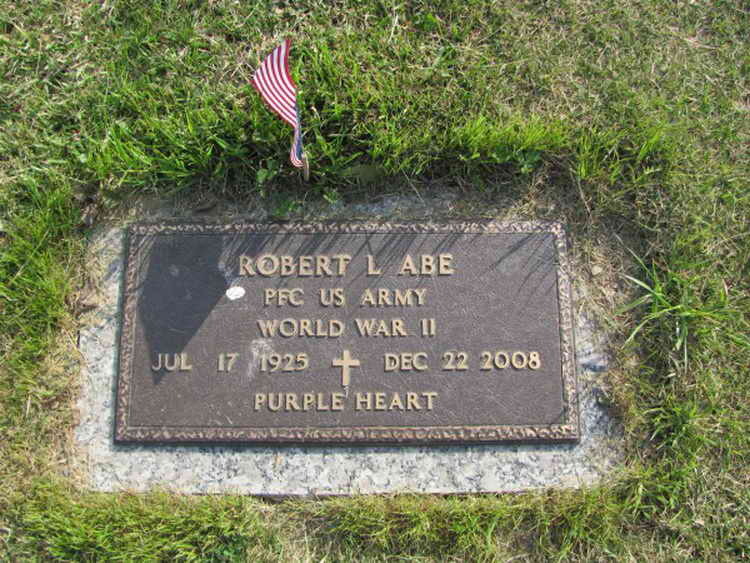 Grave marker for Robert L. Abe in Sunset Memorial Park, Cumberland (Allegany County), Maryland. Robert was a member of Company H and participated in the jump into Holland, 17 Sept 1944. He was listed as "slightly wounded: in action on 21 September 1944 and evacuated to a field hospital. On 22 December 1944, Pvt Abe was transferred to the Detachment of Patients. On 15 February 1945, he was transferred from the 3rd Replacement Depot to Company H, 508th PIR. His military decorations include the Purple Heart and the Bronze Service Arrowhead device which was awarded for the Holland campaign and Airborne operations and the Good Conduct jmedal.. CUMBERLAND — Robert L. Abe, 83, of Cumberland, passed away Monday, Dec. 22, 2008, at Devlin Manor Nursing Home. Born July 17, 1925, in Cumberland, he was the son of the late Clayton and Bernice (Buckley) Abe. He was also preceded in death by four brothers, Phillip, Aden, Rich-ard, and Ivan, and one sister, Edith Hedrick. Mr. Abe retired from the US Postal Service as a superintending engineer. He also owned and operated Raco Service Co. and Allegany Chemicals and Coatings in Cumberland. He was a graduate of Fort Hill High School class of 1943. Mr. Abe was a veteran of World War II serving with the 508th Parachute Regiment of the 82nd Airborne Division. In addition to his service awards including the Good Conduct Medal, Purple Heart Medal, European, African and Middle Eastern Ribbons, World War II Victory Ribbon and the Distinguished Unit Badge. He also received the Belgium and the Dutch Lanyard from the country of Holland for valor in action. Mr. Abe stayed in Europe after the close hostilities, serving as a member of General Eisenhower's Personal Honor Guard at SHAEF Headquarters in Frankfort, Germany. He returned to the states to march in the lead unit of the Victory Parade in New York City. He is survived by his wife of 57 years, Doris R. (Rice) Abe; sons, Steven D. Abe, of Ridgeley, and Robert M. Abe and wife Kelly, of Falling Waters, W.Va.; daughters, Christy Loffert and husband John, of LaVale, and Leslie Young, of Gettysburg, Pa.; brothers, Roger Abe and wife Maryann, and Lawrence Abe, of Frostburg; eleven grandchildren, Tracy Casto, Jody Kile, Fred Farrell Jr., Jennifer Willow, Ashley Young, Cole Young, Beth Bollinger, Kelly Abe, Stephanie Abe, Steven Abe Jr. and Jeff Abe; two stepgrandchildren, Bradey Loffert and Raleigh Loffert and twenty great-grandchildren. At his request his body will be cremated. There will be a graveside memorial service held at Sunset Memorial Park on Wednesday at noon. Military honors will be accorded by Post 13 Veterans Honor Guard. Scarpelli Funeral Home, P.A., 108 Virginia Ave., Cumberland, is assisting the family.